Filthy, wobbley funky heavy house from Guy Appleton a.k.a. 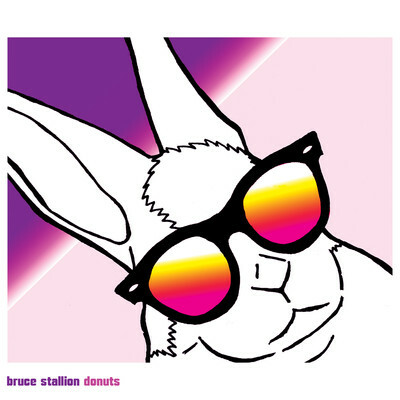 Bruce Stallion in his new Donuts EP on Tigerbeat6 label. His hectic style gained more funky rhythm and a bit more 'accessible' melody lines here, while still strongly relying on ravey, off-kilter synths, sick kicks and bouncey oldschool vibe. Which I really like :) I dig in particular this super silly sound of Heat, with the synths I remember so well from my old ravey days at the beginning of 90's (yes, I am such an old fart). Though the real highlights of this release are the pounding, heavy, straight-in-year face title track Donut, with hard kicks and snares and Optics with great spacey feel and f...g amazing vocal sample running on deep sub-bass. 4 AM dancefloor smasher par excellence! The last 3 tracks of EP show a slightly different, more mellow and less 'spastic' direction Bruce Stallion seems to follow, which does not mean their sound does not bear the trademark BS' distortions and sensitivity. All in all one of the best releases from Tigerbeat this year. As a teaser grab one track from this release and preview and buy the entire set!